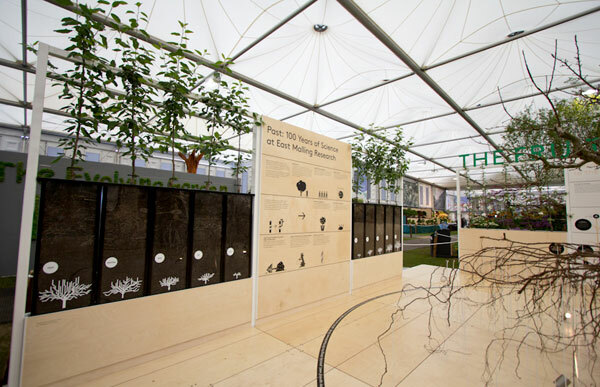 The display tells the story of how 100 years of research have transformed the way we grow apples and asking what the future holds for these trees. Apples trace their origin to the Tien Shan mountains and carried westward through the Silk Road. 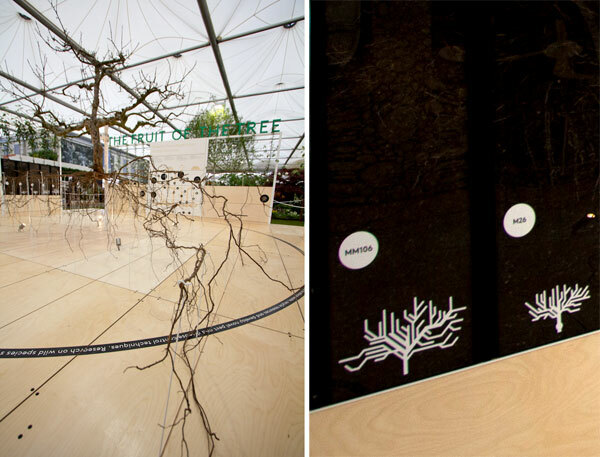 I love the way the intricate structures of the roots contrast with the bold stylized design of the surrounding text and images. However, the apples we eat today are quite different from their wild relatives. 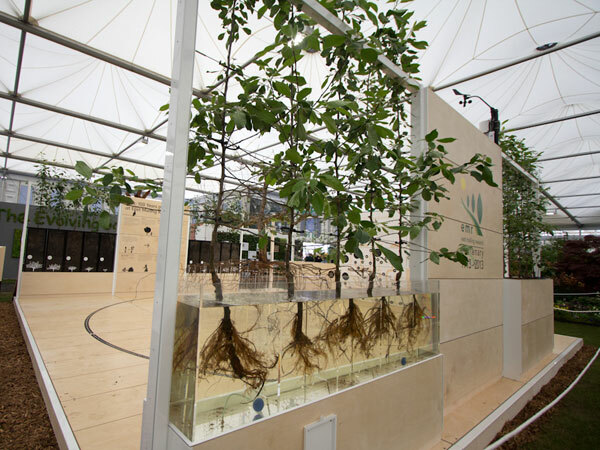 The wide range of varieties we enjoy are only made possible through research and grafting techniques, with varieties we recognize being grafted onto hardier root stocks. 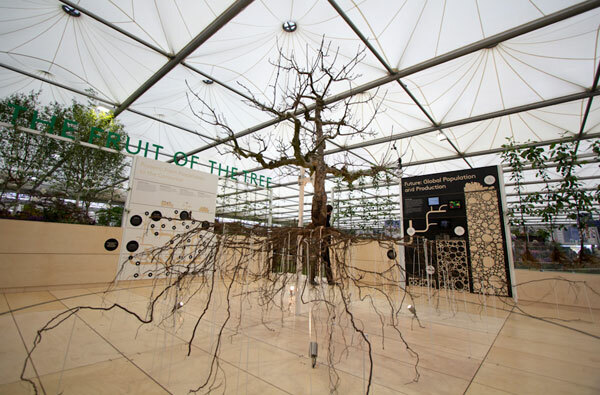 All modern cultivated apple trees comprise of a ‘scion’ variety grafted onto a hardier rootstock which is less vulnerable to wind and waterlogging than the varieties’ own roots. 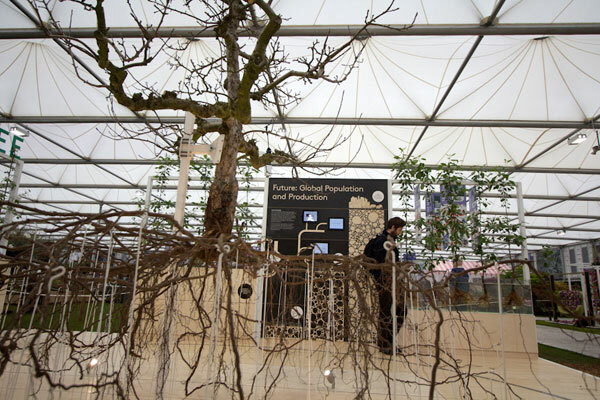 The panels to the left show a variety of rootstocks. 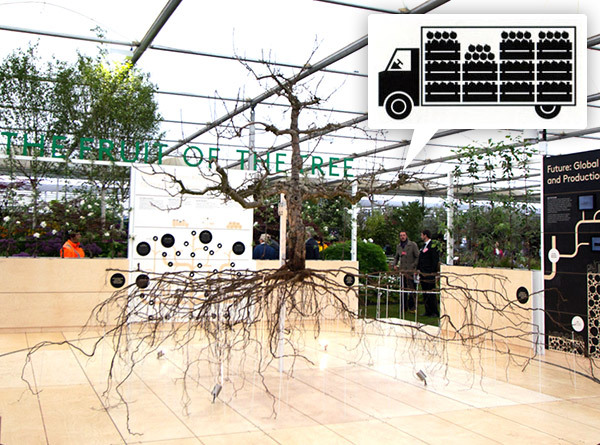 The selected rootstock can also influence the way in which trees grow, for example, creating dwarf varieties. 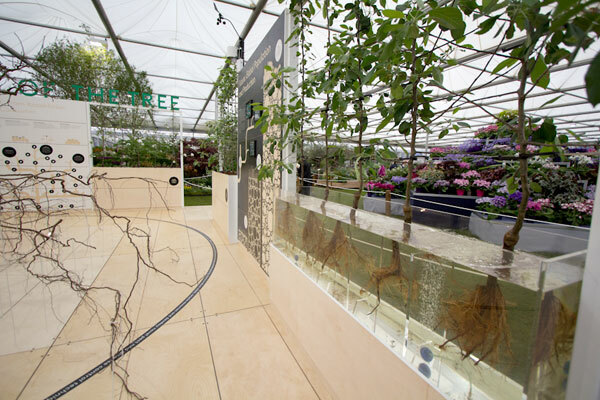 The stunning tree at the center of the display was carefully lifted and excavated with the help of supporting frames during the winter. It was then kept in cold storage to keep it in a dormant state. 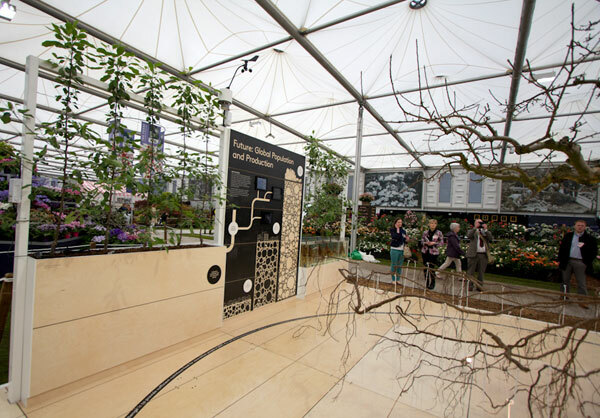 Over the course of Chelsea, the warmer temperatures will bring it out of its current dormant state, so definitely one to watch over the coming days! 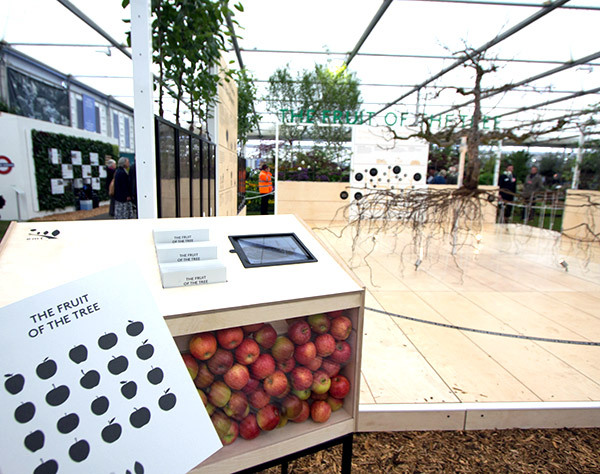 The display also looked to the future of growing apple trees. 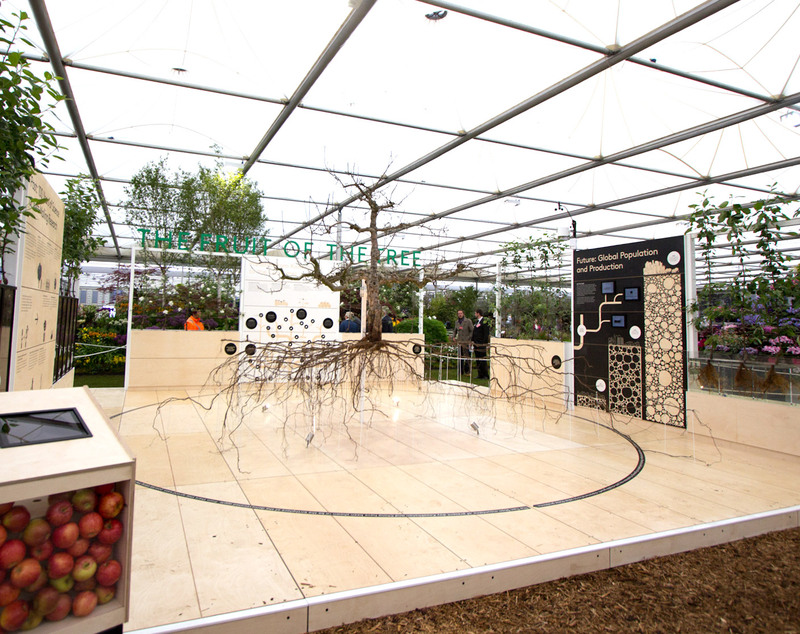 Could hydroponic setups be our future orchards? Perhaps not quite yet,but they do look beautiful! A peek inside the gorgeous booklet which accompanied the exhibition.